This was posted on April 1, 2011 by Teri Maxwell. This month we delve once again into a comment that was left on our blog in response to a blog post. We didn’t approve the comment on the blog, but we saved it so that we could address the concerns that it was raising. If you’d like to read the previous articles in this series, please do so. Here is the blog post and the comment that is the basis for this series of articles. I have addressed the benefits that I have found in my life of being a Holly Homemaker and how we would like our daughters to choose to be Holly Homemakers when they are married. 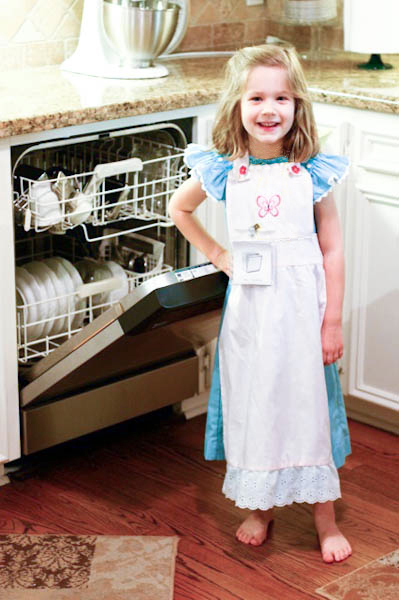 Last month we started evaluating the part of the comment where the author indicates that she/he doesn’t think a child should have more than a “few small chores here and there.” Obviously a five-year-old unloading a dishwasher is beyond the chore criteria that the blog commenter would feel is reasonable. In the previous article, we observed that in real adult life everyone will have daily, household responsibilities. Learning to do chores as children simply prepares our children to handle those tasks as adults and to have positive attitudes toward them. One mom wrote to me and listed the chores her children are doing and why it is critical to her that her children learn to work. Here is what she said. “Today, my four-year-old washed the breakfast dishes and loved it. My six-year-old also does dishes, some sweeping, and setting/clearing the table. Between them my ten and nine-year-old sons sweep the kitchen, keep the house vacuumed (except for the master bedroom and basement), do the garbage and recycling duties, clean the garage, do other yard work as asked, clean the bathroom sinks and toilets daily, take care of the dinner dishes most nights, and sometimes cook a simple meal here and there. “Recently a neighbor asked if the two older ones would be interested in helping her clean the stables of her little horse farm. She’s getting older and is unmarried. They were very enthusiastic even when they had no expectation of reward. I doubt that if it weren’t for the chores they have to do at home that they would be very eager to perform what they know will be reasonably demanding labor. “Our ‘chore life’ is not perfect, but it’s a long way from what I grew up with. I can remember moaning and fretting about small tasks until my mom gave up, and in the end, I don’t think I had any household responsibilities by the time I finished high school!! When I e-mailed to ask permission to use Mom I’s testimony about chores from her childhood and chores for her children, she sent me a bit more of the story. This is what she said. From Mom I, we have the perspective of growing up in a home where the children were given no chore responsibility. However, coming to her adult years and motherhood role, Mom I was not prepared. From this experience, she is choosing to raise her children in a different manner by teaching them how to work at home. From that decision, she is already experiencing children who can contribute a substantial amount of help to the household chores, and they are also being sought after for their diligence and skills by others even though the children are only nine and ten. In addition, these nine and ten-year-olds are excited about working to help the neighbor even though they aren’t expecting to be paid. “For, brethren, ye have been called unto liberty; only use not liberty for an occasion to the flesh, but by love serve one another” (Galatians 5:13). Don’t you think that those are children who have the potential to be whatever the Lord Jesus calls them to be in their adult lives? This is another testimonial that was sent to me after the first Holly Homemaker article where the mom was raised in a home without being taught how to work. She shares the results of that kind of childhood and what she thinks about a five-year-old who is learning to do chores. “Go to the ant, thou sluggard; consider her ways, and be wise” (Proverbs 6:6). “I want to thank you for your ministry. I have several of your books and the scheduling has refined what I was already doing immensely. I also have the Chore book and the online ChoreWare program which has helped me tremendously. It has helped me not just with the kids’ chores but with my own housekeeping and getting organized. Which leads me to this month’s Mom’s Corner. “I was raised by a single, working mom. She was too tired at the end of the day to care about the house, dinner, or even me. I was an only child. When I was asked to help out around the house, which was rare, I was defiant and lazy. When I got married and then had children, I found that I had to learn EVERYTHING on my own about how to clean and maintain a home. It has been hard. The next testimony comes from the perspective of observing the results in young adult’s lives when they haven’t learned the basics of how to take care of themselves when they are on their own. As I read this testimony, I wondered about how gently a Marine Corps soldier would teach a new recruit how to clean his barracks room versus a mommy working with her little children. The final comments I want to share with you have to do with the value of chores in helping children develop a servant’s heart. “And whatsoever ye do in word or deed, do all in the name of the Lord Jesus, giving thanks to God and the Father by him” (Colossians 3:17). Mom L wrote after she read the first Holly Homemaker Mom’s Corner and the negative comment about the blog post. As our children learn to work in our homes, we are teaching them how to work throughout their adult years. This life preparation will be transferrable to many areas in their lives. In the process, they will be learning positive attitudes toward work and developing a servant’s heart. Teaching these skills in our homes makes the transition to independent living for our children easier and less stressful because they know what needs to be done and how to do it. In addition, they are not waiting for others to take care of them. May we be mothers committed to giving our children the tools they need to be successful adults, including teaching them how to work.